This is the easiest way to make homemade applesauce. Simply place the ingredients in a slow-cooker. Serve cold for optimal sweetness! In case you hadn’t noticed, I’m all about easy recipes (for a listing of all my recipes, click here). I admire people who prepare complicated dishes, but that’s just not me. Not only do I dislike hunting down obscure ingredients (i.e. stuff I can’t find in my pantry) and too much prep or clean-up, but I honestly just like food better when it’s simple. 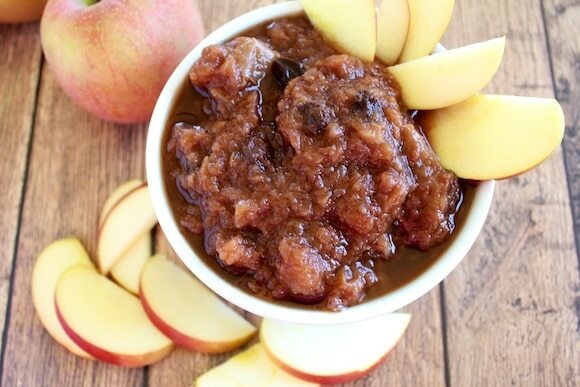 One incredibly simple yet delicious dish is my Slow-Cooker Applesauce. I made it last year about this time (you can read that post by clicking here), but I’ve simplified it even more. How’s this for an ingredient list: apples, cinnamon, and raisins. The key point is that you have to use good apples. I also suggest using organic because according to the Environmental Working Group, 98% of conventional apples have pesticide residue. This is the easiest way to make homemade applesauce. Simply place the ingredients in a slow-cooker. Serve cold for optimal sweetness. 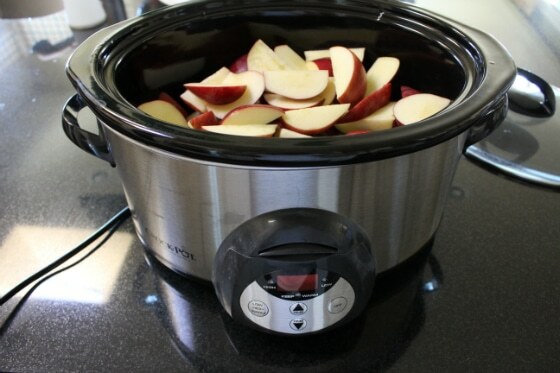 Cut apples into large chunks and place in a slow cooker. Stir in cinnamon and raisins, if using. Cook on high for 4 to 5 hours (or on low for up to 12 hours), stirring once during cooking. Cool and store in the refrigerator. For optimal sweetness, eat cold. I went apple picking this past weekend and so this is perfect right now!! Thanks!! I make a fish recipe using fish, a simple sauce with only 3 ingredients(mayo, parm cheese and hot sauce) and Panko breadcrumbs and not too long ago I made pumpkin muffin cakes which just used cake mix and a can of pumpkin!! Super easy. I have made this apple recipe before, with less apples, and it was awesome. I still have some I froze. 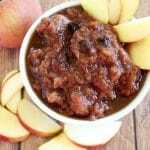 I’ve made apple butter in the crockpot before but never applesauce. I especially like that you leave the skins on because peeling apples is a PITA. 🙂 Thanks for the recipe! The applesauce looks awesome—and I bet it smells amazing! Why not forget the crockpot, preserve heat-sensitive nutrients, and make raw applesauce instead? Core the apples, cut ’em into chunks, and throw ’em into the food processor. Add some fresh lemon juice to zing up the taste, and process to applesauce-consistency. Sprinkle w/cinnamon. I love the simplicity of the applesauce. We”re going upstate this weekend and I hope to get lots of apples! Sounds like a blast, I loooove freshly-picked apples! This is great because I have a huge, 7 quart or whatever the biggest size is, crock pot and I never use it because it is just too big (it’s just me and my husband and our 3 yo). And peeling apples takes forever (though I technically don’t mind it, I do when it takes 30 minutes!). Can you share any other useful recipes that you make in your big crock pot?? 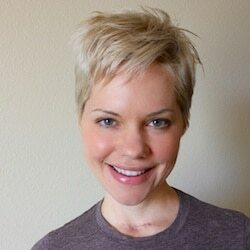 Hi Dawn, I will start working on some slow-cooker dishes, I love how easy they are to prepare! 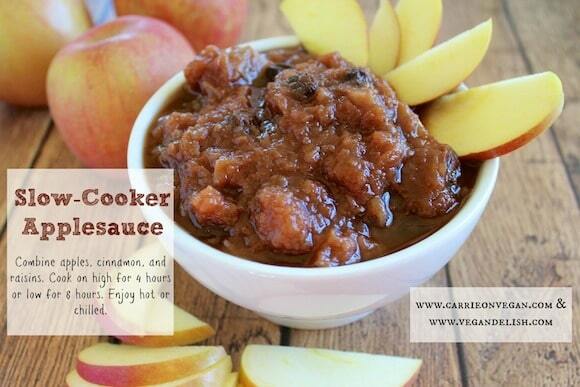 I totally need to make some easy applesauce! My crock pot could use more work. I’m thinking a vanilla-spice version would be tasty. Oh yes, vanilla would be great! You can also add raisins if you want to make it sweeter. I usually make a version of this applesauce using the microwave but I made this last night and I’m hooked! It is so good. I have already eaten almost half of it! I agree, it’s easy to prepare and looks so yummy! Thanks Carrie for this great recipe!